Electric Insulators Market size for 2017 was valued over USD 4 billion and is set to exceed an annual installation of 200 million units by 2024. Growing investments toward the refurbishment of aging grid infrastructure across developed economies along with the growing adoption of smart grid technology will stimulate the global electric insulators market size. Sizeable expenditure toward modernization of electrical infrastructure along with rapid urbanization will further drive the industry. According to the recent report of World Energy Outlook, an investment of over USD 3.4 trillion contribute to the refurbishment and replacement of existing assets. Aging equipment, increased demand and capacity bottlenecks, along with growing emphasis toward capacity addition of power generation will augment the industry growth. Escalating legislative measures toward the expansion of reliable grid infrastructure in developing nations will further complement the business landscape. Porcelain electric insulators market is anticipated to expand over 4% by 2024. Ability to offer optimum mechanical strength and considerable stress resistance are the key factors supporting the product’s dominance across the industry landscape. However, growing prominence of polymeric counterparts are expected to offer a competitive edge to these insulators. 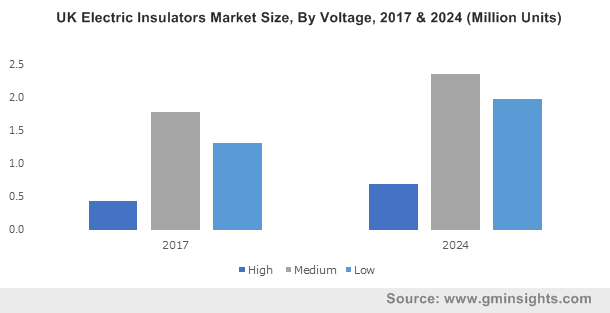 Composite electric insulators market is set to grow on account of their operational suitability and flexibility across a wider range of transmission and distribution voltages. Light weight, durability, high bending, tensile strength and compactness are some of the other competitive features contributing to the increased product demand growth. Medium voltage is set to grow over 5% by 2024. These insulators are primarily deployed across residential and commercial establishments to support medium voltage ranges. Legislative ventures to expand electrical infrastructure across developing nations along with growing commercialization and urbanization will further boost industry growth. Ongoing expansion of T&D infrastructure to support large-scale renewable power integration across developing regions will drive the adoption of high voltage electric insulators. Favorable government initiatives along with growing investments by privately owned utilities toward reinforcing reliable grid networks will further complement the industry landscape. Transformers, in 2017 held over 15% of the global electric insulators market share. Rising concerns over power thefts and protection along with increasing focus on real time monitoring of power networks will foster the industry growth. For instance, recent introduction of Internet of Thing (IoT) based transformers to effectively control and monitor electrical grids will favour the business scenario. Cables and transmission lines will witness an appreciable growth on account of growing legislative support for the expansion of international border transmission systems. For instance, the U.S. Department of Energy (DOE) supports the development of cross-border transmission lines between the U.S. and Mexico. Pin electric insulators market is predicted to expand over 5% by 2024. These insulators find prevalent applications across distribution and sub-transmission lines and may be in form of single-piece or multi-piece, depending on the voltage of application. High anti-fog performance, ease of manufacture, and operational flexibility are some of the underlying parameters supporting the product penetration. Utilities electric insulators market is expected to grow over 6% by 2024. Increasing R&D expenditures toward modernizing grid networks in response to increased electricity demand will stimulate the industry growth. Deployment of integrated smart grid technologies supported by several national rollout schemes will further support industry growth. Residential electric insulators market will witness growth on account of rapid urbanization accompanied by burgeoning energy demand across the developing economies. Ongoing transition toward clean energy sources and micro grid establishments for renewable power integration will further complement the business landscape. 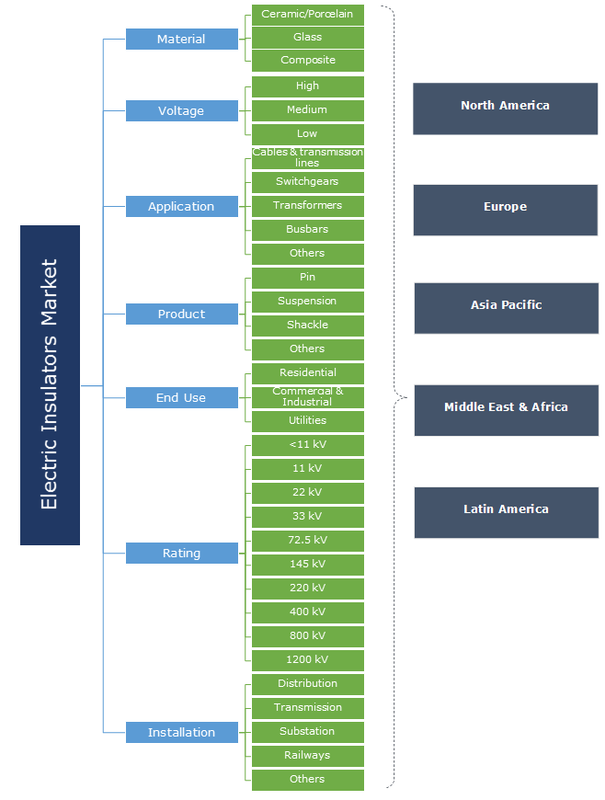 <11 kV electric insulators market in 2017, was valued over USD 200 million. High end applicability of low voltage insulators across residential establishments will augment the industry landscape. Growing demand for sustainable energy mix accompanied with ongoing developments of grid networks across developing economies will further foster the industry growth. 400 kV insulators will witness large-scale deployment on account of expansion of high-tension networks for long-route electrical supply. Operational safety and ability to withstand mechanical load will further influence the business landscape. Ongoing extension of utility aided high voltage grid infrastructure to furnish the increasing electricity demand across industrial establishments will augment the transmission electric insulators market. Favorable regulatory restructuring in line with the refurbishment of electrical infrastructure have further instigated an appreciable business scenario. China market is anticipated to expand over 5% by 2024. Favorable government reforms toward energy efficiency along with strengthening focus on upgradation and expansion of the existing T&D infrastructure will propel the business landscape. For instance, in 2016 the State Grid Corporation of China (SGCC) announced plans to expand investment in the country’s electrical transmission infrastructure by 28% over the period of next five years. U.S. market, in 2017 was valued over USD 400 million. Rising government efforts toward clean energy economy and renewable power integration has driven investments in the country’s power transmission infrastructure, which in turn will fuel the industry growth. In 2015, the Federal Energy Regulatory Commission has nearly tripled the transmission expenditures to over USD 15 billion when compared with 2006.
Notable industry players include General Electric, ABB, Siemens, Hubbell Lapp Insulators, NGK Insulators, Aditya Birla., Maclean Fogg, Elsewedy Electric, Seves Group, BHEL, and TE Connectivity among others. An electrical insulator is defined as a material that prevents the undesirable flow of current from an electrical system to the earth. These materials are primarily deployed to provide a resistive path to the current flow in an electrical system.